AB Commander is a powerful yet easy to use file management tool for computers running the Windows operating systems. It lets you manage your files and folders easier and faster, using the convenient double-panel framework (pioneered in Norton Commander), while maintaining close integration with the standard Windows user interface. The main window of AB Commander hosts two panels, independently displaying the contents of folders of your computer, just like the built-in Windows Explorer does. Each panel may be used to browse all folders, both virtual and real ones, located on local or remote drives. Having two independent panels is especially convenient when copying or moving files, enabling you to see the contents of the source and destination folders simultaneously. If you are a file ninja who needs to keep track of the files in several folders at once, AB Commander lets you open several tabs, and use them to browse several folders at the same time. AB Commander offers several powerful means of navigation between folders: the Folder bar that lets you browse the whole hierarchy of folders, the Favorites list, the Most Recently Visited Folders (History) lists, the Drive bar and Drive menu, and more. AB Commander offers commands to works with files and folders directly ( that is, copy, move, rename, delete, and more.) 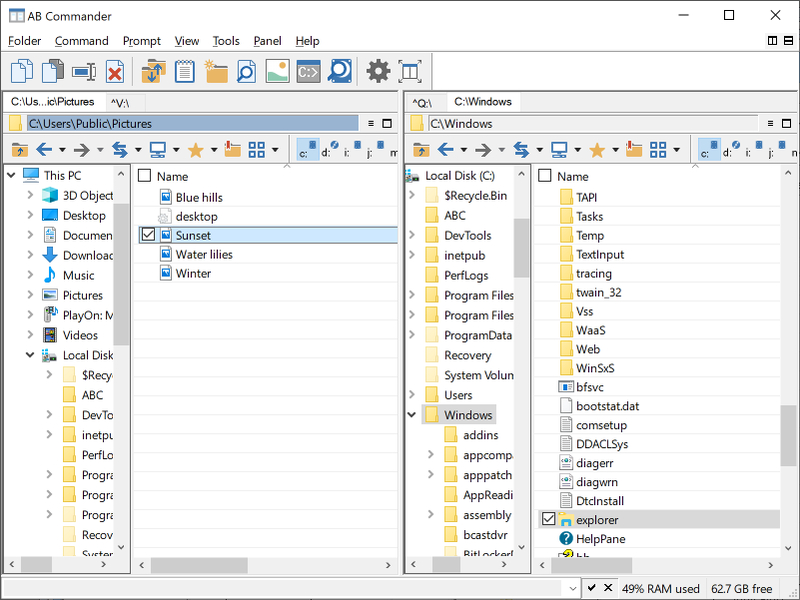 Unlike the built-in commands offered by Windows Explorer (which are still available and supported), AB Commander's commands do not involve the use of the clipboard. So now you can work with files in a direct and straightforward way. If you often move files between your desktop computer and a laptop, you will appreciate the commands to compare and synchronize folders. The command prompt lets you quickly run programs that accept command-line arguments. AB Commander saves you time by allowing you to insert the names or full paths of the selected file objects directly into the command prompt. AB Commander includes a full-featured text editor that you can use to quickly view and edit text files. You can use the built-in text editor or set up your favorite text processor as the external Quick Editor to be used by AB Commander. The built-in text finder lets you search for text fragments in a large number of text files and see the results. The built-in image viewer lets you quickly preview image file, or see several images as a slide show. AB Commander supports the tabbed browsing, that you can use to have your favorite folders available for browsing in separate tabs, one click away. The built-in file splitter lets you split large files into smaller segments and then merge them back with ease. You can set up your favorite text editor or file viewer as the external editor or viewer of AB Commander to be able to quickly edit or view files right within AB Commander. You can also choose to use the standard Windows Search as an alternative method for finding files, or set up another file searching utility for that purpose. Status bar indicators show various pieces of useful information, such as the current load of the RAM (Random Access Memory), free space left on the current drive, the current date and/or time, etc. You can control which indicators are displayed. While providing new means to work with your files and folders, AB Commander fully supports the traditional tools and commands offered by the Windows user interface, such as the right-click accessible shortcut menus, the panel toolbars that let you copy, cut, and paste files via the clipboard (just like Windows Explorer does), drag-and-drop operations, etc. AB Commander may be used both on a single machine and on a network. Each user can configure and use AB Commander independently on the others. Customize the appearance and functionality to suit your personal working style. AB Commander offers various ways of customizing the look and feel of the listings shown in the panels according to your preferences: single- or double-click activation, full row selection, underlining the hot or cold items, etc..